Crohn disease is an inflammation of the intestines caused by immune response to an infection. 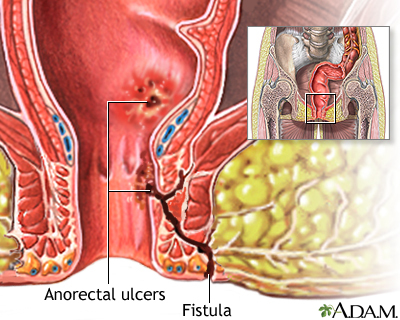 The lining of the intestine may ulcerate and form channels of infection, called fistulas. Fistulas tunnel from the area of ulceration, creating a hole which may continue until it reaches the surface of the organ, or the surface of nearby skin. These holes typically spread the infection that creates them, and life-threatening conditions such as peritonitis (inflammation of the lining of the abdomen) may occur.